Conserving energy is good for the environment and for saving money when it’s time to pay one’s energy bill. For companies, it is also big business, as they create new and improved ways to help consumers accomplish this goal. There is, however, a simple, long-term, and relatively inexpensive way to accomplish this – planting trees. Trees can significantly reduce one’s energy bill during both the summer and winter months; the key is to understand which types of trees to use and where to plant them. During the summer months, trees can reduce the need for air conditioning by providing shade and reducing the need to use electricity to cool the home. The ability to do this depends on couple of things 1) the use of large deciduous shade trees and 2) their placement. Deciduous trees are leafy trees that are full and leafy during the summer months, but lose their leaves during the fall and winter. The shade that these trees cast will help block the heat from the summer sun; however, the leaf loss and winter dormancy is more essential to winter energy needs. Strategic placement of the trees is necessary in order to achieve the maximum possible benefit. This means planting trees on the northwest, west, and south sides of the home in a location that blocks the windows. To reduce any blocking of the view, one may choose to prune the lowest branches of the trees as this will not affect its ability to block the sun’s rays. In addition to planting trees in these locations, it is also beneficial to plant more trees over driveways and decks or patios. Providing shade over air conditioning units will improve the efficiency of the machine and help it to run cooler when needed. By properly planting the correct trees a person can easily save up to thirty percent on his or her bill. Winter can also have a negative influence on energy bills due to the excess use of heaters to warm one’s living space. As previously noted, deciduous trees lose their leaves during the winter. This allows the winter sun to beam through them and warm the home. To the north of the home, plant evergreen trees such as conifers. The trees will allow the warm sunlight in while serving as windbreaks to block cold winter winds. As a result, homeowners may see savings ranging from ten percent to 50% off their winter energy bills. People should avoid planting evergreens on the east or west as they will block the warming sun. This natural solution provides shade in the summer and warmth in the winter. As a result, it saves a significant amount of energy and money when it comes to cooling during the hot months and heating during the cold months. In addition, trees also help clean the air and may raise the property value of one’s home. How to Plant Trees to Conserve Energy: An explanation of how to properly plant trees to conserve energy on the Arbor Day Foundation website. The page includes an animated image and links that take the reader to further information about trees as winter windbreaks and for winter warmth. Landscaping for Shade: An article on the Energy.gov website that discusses how trees around the home can reduce energy consumption. 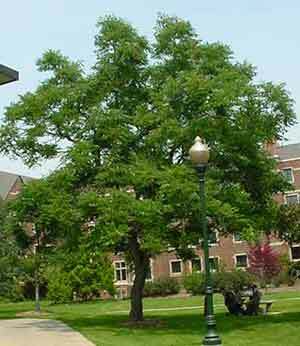 The article focuses on the type of evergreen and deciduous trees that should be used. Landscaping for Energy Efficiency: This PDF document reviews the benefits of having a well landscaped yard and how it can save money year round. The article also discusses the best way to select and plan the trees. New Study: Home Energy Savings are Made in the Shade: The results of a study on how trees decrease electricity use. The article reviews how tree placement can decrease or increase electricity usage. Landscape Properly to Increase Energy Efficiency: A section on the Indiana government website that discusses how landscaping can help lower one’s energy bill. The section explains using trees as shade for the air conditioner and shade for the home. Trees and Energy: In this PDF brochure there is information on how trees can reduce energy levels in rural and urban environments. The brochure is courtesy of the South Dakota Department of Agriculture. Forest and Trees: Overview and Benefits of Trees: Learn the many benefits of trees including how they benefit energy, climate and air quality. The article also reviews other ways in which trees benefit the home. Energy Efficiency: Saving Energy at Home: Learn ten ways to save energy in the home, including the planting of trees. The listed is numbered with trees appearing as number nine with landscaping. Trees, More Than an Aesthetic Investment (PDF): This press release discusses planting trees to save money and energy. It also reviews the best type of tree to plant and the best location to plant them. Trees – Facts: Facts about trees are listed on the upper section of this PDF. Readers will find several facts about trees and energy. Auburn University Study: Shade Trees Can Reduce Power Bills by 11.4 Percent: Discussion of a study conducted by Auburn university regarding trees and the reduction of home electric bills. Conserving Energy With Plants: Energy conservation using plants is the topic of discussion on this North Carolina State University page. The article primarily focuses on the use of trees, but also briefly touches on other windbreaks. Shade Trees Reduce Energy Use: Shade trees and their ability to help reduce energy use is the topic of discussion on this page. The article reviews where trees should be placed, their sizes and what should not be done. Trees Save Energy: Information that explains how trees reduce energy usage in the home. Readers will learn what types of trees to use and where they should be planted.